We’ve all seen that mediocre sports film, haven’t we? It’s the one about the washed-up team without a chance that ends up rallying around a coach, overcoming every obstacle to defy the odds, and failing to surprise anyone in the movie theatre by winning the big whatever. That film has over a hundred titles and the cast varies occasionally, but it’s essentially the same one every time. Thankfully, Friday Night Lights is not that movie. Based on a true story, Friday Night Lights has a different tale to tell; not a tale of disappointing football players, but of disappointing people. It doesn’t show a team in shambles, but rather an entire community...an entire world. The high school football players in this story aren’t students who play football on the side. These are kids who don’t have anything else. They live and die on the field, and all that matters in life is scoring more points than the other team before the clock runs out. The trouble is that nothing lasts forever, and after 10 years of experiencing nothing but 100 yards of life, the world begins to look too big for comfort. The film is set in Odessa, Texas, 1988, and the first image on screen is a seemingly endless West-Texas sky. One the one hand, the possibilities are endless and the sky’s the limit. The film doesn’t waste any time getting down to the reality of that imagery, though: the sky is endlessly repressive; there’s no escaping it. 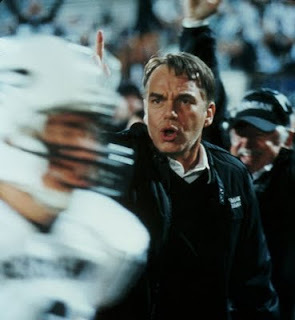 The Permian Panthers are led by Gary Gaines (Billy Bob Thornton), a veteran coach who seems instantly down to earth. Thornton is the perfect choice as the simple man just trying to do his best. Everyone else expects infinately more of him than his best, and this is where Friday Night Lights stands alone. The protagonist team is fully expected to win. The entire town has made up its mind before the season ever begins, and the biggest struggle for this team is living up to its own expectations. The story itself is obviously true; it’s not the kind of tale a screenwriter would craft. Everything about it seems real. There’s no cheesy conversations between the coach and the struggling athlete or melodramatic pep-talks at halftime. In fact, there’s not even much of a romance, something many sports movies attempt, but don’t know how to handle. There are still scenes involving conversations and pep-talks, they’re just not overdone. This serves as a double-edged sword, though, because the movie isn’t very uplifting or inspiring. In fact, it’s almost depressing. In a small town where high school football is everything, there exists a vicious cycle of generations that grow up too fast. One of the most powerful moments comes when three students are sitting on the side of the road, talking. The conversation is pretty grave, centering on the remainder of their shaky season. One boy tries to call everything into prospective, reminding his friends, “We’re just seventeen years old.” One of his comrades turns around immediately and asks retorically, “Do you feel like you’re seventeen?” Of course not. Their youth was the price of the life they were born into. Another jarringly raw moment is when an injured player breaks down in tears and realizes for the first time in his life that he might have to do something besides football. None of them are ready to leave the game, but high school is coming to an end, whether they win or not. Friday Night Lights looks better than most sports movies. The film itself is gritty and almost a sandy color, much like West-Texas itself. The camera remains unusually active, refusing to hold still for more than a few seconds, and occasional extreme close-ups help keep it visually interesting. Performances are good all around, including a surprisingly sharp appearance by Tim McGraw as a drunken, verbally abusive father. Billy Bob Thornton remains well within his everyman element; his Gary Gaines is the only character who realizes what life is really about. Everyone else learns the hard way.